“I want to feel the sun on my skin,” a slogan artist Ma Yongfeng pulled from conversations with workers at Bernard Controls Beijing. LOS ANGELES — The image of the Chinese manufacturing plant is quickly becoming a 21st century icon of production, just as the car plants of Fordism were in the 20th century and Victorian coal mines were during the Industrial Revolution. They’re frequently portrayed as sites of high efficiency, but rarely as spaces for art, humanity and wonder. In 2010, Beijing-based Italian artist Alessandro Rolandi staged a series of interventions in a Beijing factory run by Frenchman Guillaume Bernard. These well-received interventions have now become a curated series of invitationals to local artists. Determined that should be predominantly experimental in nature, Rolandi still drew a strong connection to his goal of tying the work to labor: “We invented a definition using enterprise language to give legitimacy to the project and make it understandable (at least its general nature) to people working in companies,” he noted. And so the name of the project was born: Social Sensibility R&D Program, situated at Bernard Controls Asia. The stencils themselves are re-interpretations of Chinese propaganda, lifted from conversations with workers and reflective of the strict systems of control. Rolandi also noted the effort of Lulu Li to provide ambient music for workers. “Even in Europe in most factories, listening to music is now forbidden for various reasons, from safety to concentration, and here we tried with these small devices and rhytmic compositions from classical to experimental to noise (avoiding words, as they are proved to affect concentration),” he says. After a series of negotiations with floor managers, Li and Rolandi agreed to only play music on Fridays, at least for the moment. There’s a tension to the idea that the artists, at the behest of top brass, can move around freely and explore interventions, while the workers themselves must remain in optimal flow under the strict rules enforced and determined by the very same management. The artists of the Social Sensibility R&D Program are not oblivious to this. Sanderson goes on to explore Rolandi’s own initiation into the workers’ lives by undergoing the training procedures and entering the world of high-efficiency production, as well as some of the questions he wrestled with. It calls to mind some of the work done by Cao Fei with factory workers in southern China, where the majority of the manufacturing sector is concentrated. Her PRD Anti-Heroes and Whose Utopia project looked at types of similar work. Unlike Sanderson, I’ve not seen the interventions in person, so I can’t comment on their merits per se. But seeing the videos and speaking with the artists, I find that what makes Social Sensibility interesting is Rolandi’s choice to invite artists to stage interventions in two-month phases. The in and out of the artists over time reflects the rhythms of factory life, and the diversity of perspectives allows for a certain freshness to each intervention. The Social Sensibility R&D Program is an ongoing project at Bernard Controls Beijing (A2-1, Lidaxing Industrial Zone, No.15, Fourth JingHai Road, Economic & Technological Development Area, Beijing). LOS ANGELES — We’re all familiar with sharing sites like Airbnb that help you rent out your room to peers and even strangers. And there are a rising number of sites that let you share home appliances like a Roomba with your neighbors. The sites usually focus on one-way sharing interactions, and usually for the point of utility. Forget Art, the Beijing-based collective run by Ma Yongfeng, wants to get people talking to each other. Youth Apartment Exchange Project (青年公寓交换) is an initiative to encourage urban dwellers in China not just to share their items, but to exchange them. This could range from a simple exchange, like cell phones, to even trading and sharing apartments. Previously a BBS, the site now uses a private Sina Weibo feed, tapping into the Twitter-like service’s broad network (some 300 million users) to encourage interaction. Though the feed is relatively new, users are already posting images, using a hashtag to organize. 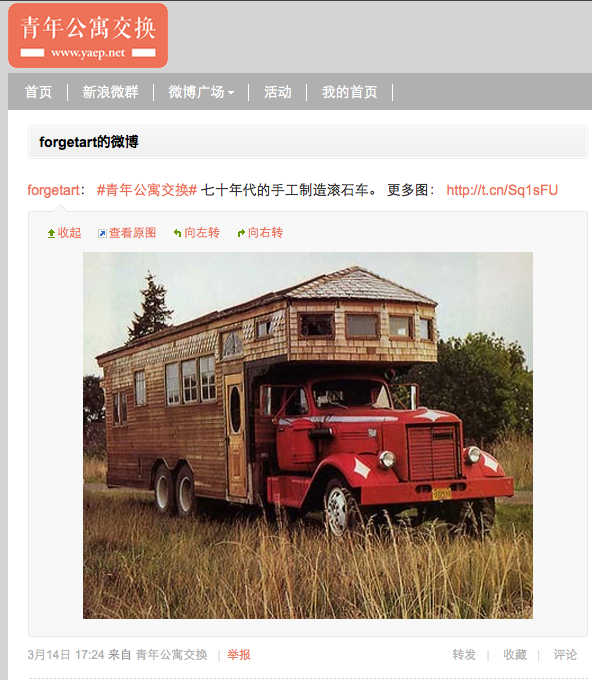 Ma Yongfeng recently posted a handmade truck from the 1970s, and in the BBS version, users traded phones and even homes. When I was little I especially wanted to have an RV. I would go wherever I wanted to go and carry around my own little home. Wherever I wanted to stay, I could stay for a day. That would be very nice. Youth Apartment Exchange is a simple social media platform to get people talking. As Ma Yongfeng told me, he wants the site to encourage online users to trade and exchange and meet people outside their immediate circle. 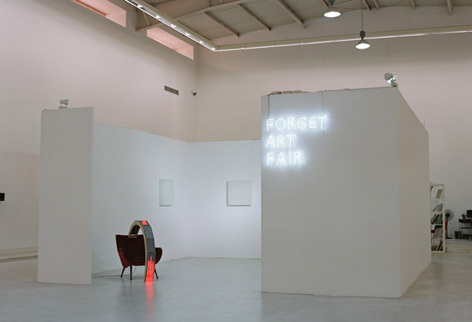 The “Forget Art Fair,” installed by Linda Gallery in Beijing’s 798 Art Zone. The fair competed — tongue in cheek — with the 2011 edition of Art Basel and even passed out VIP cards for visitors. LOS ANGELES — After spending a year living in different parts of Asia, I’ve been asked by many people for my thoughts on the art scene there: Does China really live up to the hype? How does Korea fit into the picture? And what about Southeast Asia? Unfortunately, I can’t answer all of these questions, especially because after a year there I felt I was just beginning to scratch the surface. But I was fortunate to meet some incredible artists in my travels. In China, Korea and the Philippines, I came across very challenging and interesting work, which sprung up out of very different traditions and sociocultural contexts. But which artists stood out? Whose work am I most looking forward to in the coming year? Rather than write a 2011 summary, I thought I’d write a 2012 “head’s up”, a list of artists whose work continues to stick in my head and who I hope to see more from in the coming year. This list is neither scientific nor exhaustive, but I’ve at least arranged it by the four cities in which I spent the most of my time in 2011. 12:50 pm, Ma Yongfeng’s microintervention on a bathroom door at MK2 Art Space for “Memory/Identity,” curated by Alessandro Rolandi. With news of Zhang Daqian toppling Picasso as top auction earner, it can be easy to lose sight of Chinese artists working largely outside the commercial sphere. Founded by Ma Yongfeng, whose goldfish video at MoMA PS1 provoked outcries from animal rights activists, Forget Art is one of Beijing’s most active art collectives, with a focus on microinterventions around the city, from an old Taoist temple to a bath house frequented by rural migrants. Forget Art’s one booth art fair at Linda Gallery made a splash on June 4 for its wry humor and subterfuge (some attendees received a VIP pass), and their cover photo essay in LEAP magazine featured guerilla art interventions like a leaf spiked through a twig in a park near 798. Forget Art has grown increasingly active in the Beijing art scene, with a recent installation at Za Jia, an art space, bar and formal Taoist temple in Beijing’s Drum and Bell Temple area. Dubbed Not Only a Taoist Troublemaker, works included “Suspending Rock,” a performance and installation by Wu Yuren, who stood under a 100 kg hanging rock for two hours, and a propaganda-style poster by Alessandro Rolandi declaring “May Your Matters Be Safe.” I never saw their installation at Caochangdi’s Dragon Fountain Bathhouse, but residents in the village were talking about it for months afterward, and the documentation video certainly reveals its charm. 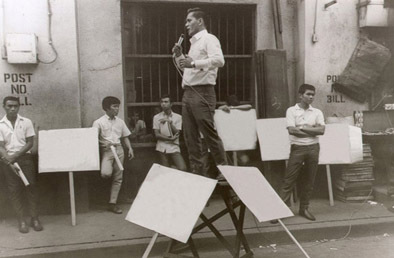 Kiri Lluch Dalena’s “Erased Slogans,” focused on famous protests in recent Philippine history. I wrote about Kiri Lluch Dalena’s haunting installation at the University of the Philippines recently, in which she responded to and documented the aftermath of the horrific Maguindanao Massacre, the worst massacre of journalists since the Committee to Protect Journalists began keeping record. Since then, I’ve come to learn more about Dalena’s work, which shifts comfortably from challenging video documentaries examining social and political issues in the Philippines, to more lighthearted works. Recently at Now Gallery in Makati, Manila, she exhibited a half dozen condom sculptures, each shaped and colored differently. The colors were inspired by actual flavored condom colors available in the country. Part of what makes Dalena’s work so impactful is the way she relies on the Filipino community to help her document much of her subject matter. To prepare for Time and Place of Incident, she used social networks like Facebook and blogs to develop contacts. And for certain hard-to-reach areas, she relied on volunteers to film for her. The sense of play and gravity come together in her Erased Slogans, in which she Photoshopped out the political slogans at famous protests in recent history. The images are darkly humorous, and the slogans reappear as actual gravestones in a later installation. I first met Xiao Ke during her stunning “Silent Acappella” at Welcome to Enter, a curatorial initiative by Anita Hawkins in which I also took part. In her performance, Xiao Ke performed inside the cube set up by Hawkins, while her dance was projected on the outside for the audience. The mixture of kinetic movements and wall banging with her surreal, hypnotic movements on two faces of the cube hooked us all in, and I wanted to see more. Her Shanghai-based dance studio has collaborated internationally, and she’s now stepping into more conceptual dance explorations. Dirk Fleischmann’s myfashionindustries label, produced in both North Korea and the Philippines. Purchasers receive a video illustrating the entire production process. You might think that Dirk Fleischmann doesn’t sound very Korean, and you’d certainly be right. 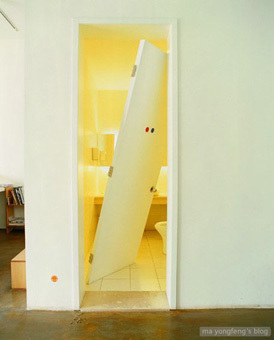 German-born Fleischmann lives and works in Seoul, and his autobiographical myconceptstore, which premiered at the 2011 Gwangju Design Biennale, was a hit attraction. The store featured a number of conceptual products from his art career, including a series of watches all set to 00:10, or 10 seconds. Without looking at the watches, Fleischmann used trial and error to set a perfect 00:10. The amount of time it took for him to set 10 seconds determined the price. Other products included an organic egg from Gwangju, which I purchased, Snickers bars he used to sell in his studio as an art student, beer from North Korea and even a line of clothing made in the communist Korea. I wish I could write more about the art in Asia, and I have and will be doing so in this blog. These artists’ works have lingered in my mind a little longer than most, and I’m looking forward to seeing what they produce in 2012.